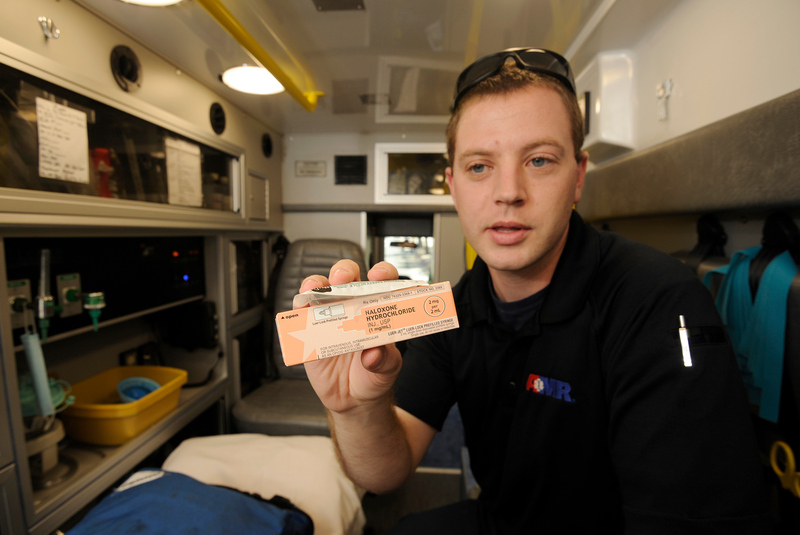 AMR paramedic Jimmy Dane holds a dose of Narcan. One week after President Donald Trump declared the national epidemic of opioid addiction a “public health emergency” and vowed ​— ​among other things ​— ​to wage a “really big, really great advertising” blitz against drug use, Santa Barbara health authorities remain politely underwhelmed. Such hairsplitting is pregnant with financial consequence. Had Trump declared the crisis a national health emergency, federal purse strings would have opened up. But for a “public health emergency,” funding remains, at best, problematic. And opioid addiction is anything but cheap. “The immediate funding provided by this declaration falls short of what is necessary to truly combat this growing crisis,“ declared Congressmember Salud Carbajal. Fifty people died of opioid overdoses in Carbajal’s district last year; the year before, opioids sent 110 people to the emergency rooms in Santa Barbara and San Luis Obispo counties. According to a recent death ranking published by the University of Wisconsin, Santa Barbara County has the 28th highest overdose death rate among California’s 58 counties, almost right in the middle. The big news, according to Doyel’s boss, Gleghorn, is the county’s embrace of naloxone, a drug that revives overdose victims. Of the 450 kits given out, Gleghorn said, 150 have been used, meaning 150 overdose deaths were prevented. Gleghorn’s office works closely with Pacific Pride in getting naloxone kits into the hands of likely overdosers. Often, she said, these are people who used to use but stopped. They either just got released from jail or prison or relapsed after getting out of a rehab program. The County Sheriff’s Office just got actively involved in the distribution of naloxone as well. “A lot more lives are going to get saved,” Gleghorn said. Naloxone, she noted, used to cost $7 for two doses; now it’s $50. Drug addiction activists are lobbying Trump to use the buying power of the federal government to negotiate cheaper prices with naloxone’s manufacturers to make the drug more widely affordable. In the meantime, Behavioral Wellness is about to issue a request for proposals for a new 32-bed drug rehab center that will accept payment by Medicaid. When built, it will accommodate stays as long as 90 days. “For Santa Barbara County, this will be brand new,” Gleghorn said. “We don’t have anything like this.” She estimated the county could accommodate twice the number of drug rehab patients once the new center is built. In the meantime, enforcement of drug dispensing rules and regulations has gotten a lot tighter. Sansum Clinic reports Drug Enforcement Agency (DEA) agents routinely audit its pharmacy. Companies that sell narcotics wholesale hire DEA agents to eyeball Sansum’s patient mix to ensure narcotics are getting into the right hands. Until two years ago, Sansum’s pharmacy was owned by a private vendor who sailed under the Sansum flag until he was put out of business by the California Board of Pharmacy for failing to exercise “due diligence” when dispensing drugs for Dr. Julio Diaz, since convicted and sentenced to 27 years for illegally selling narcotics. Since 2012, the same board has targeted six pharmacies in Santa Barbara County and 13 pharmacists. “I was trained as a pharmacist. I was trained to care for people. I wasn’t trained to be a police officer,” objected one pharmacist to what he’s termed “the witch-hunt atmosphere.” “How can I care for them when I’m treating my clients like they’re criminals?” At Sansum, they take extra care, running every narcotic prescription through a statewide database to ensure the buyer isn’t getting other prescriptions filled at multiple pharmacies. They screen customers to make sure they and their doctor are both from Santa Barbara and that the doctor is in good standing. Editor’s Note: This story was changed to state that it is $11 million, not $11, that CenCal spends annually on prescriptions.